Welcome to the third part of these Lua 5.2 personal notes. If you have not yet, you may want to read my previous notes on running Lua 5.2 scripts from C++ or passing variables from Lua 5.2 to C++. This new tutorial explains how to call C++ functions from Lua 5.2, including passing and receiving arguments from them. These notes are based on the Lua-User Wiki Sample Code and the Lua 5.2 Reference Manual, as usual, and on the tutorial by Christian Stigen Larsen. 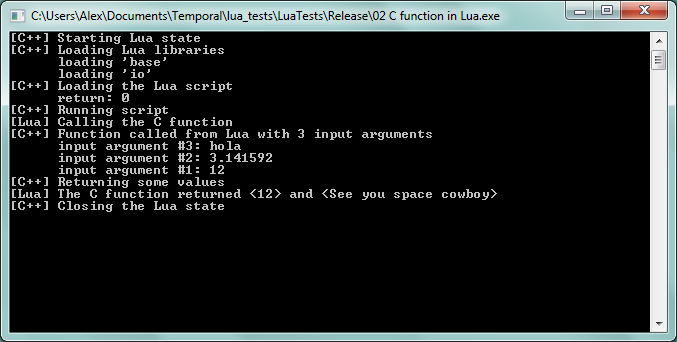 First, I will show you some code (in Lua and C++) and the execution output. Afterwards comes the details of the most difficult parts. std::cout << " input argument #" << argc-i << ": "
(my thanks to kpityu for pointing this out in the comments). i. e., the function must return an integer and only accept one input argument of type pointer-to lua_state. With this we have covered the basic protocol for creating new C++ functions that are Lua compatible. In case you want more examples you can check the Lua libraries, which are made of C++ functions following these rules. Stay tuned for the next episode of these personal notes. I am not sure if I will be talking about linking C++ dynamic libraries to Lua or about encapsulating and passing objects from and to Lua. There is not lua_pushfunction in the reference only lua_pushcfunction. lua_register works in one step. Thanks for the tutorials! These were to be the only tutorials targeted at Lua *5.2* that I could find, and they helped me a lot! Fantastic job! One minor nit, “First” is misspelled “Frist” in third paragraph…. This helped my a lot, I couldn’t find any example using Lua 5.2 ty!